Also known as Iron bamboo or Calcutta bamboo in the West, TamVong bamboo in Vietnam, A deciduous densely tufted bamboo. Culms 8-16 m high, 2.5-8 cm diameter, pale blue green when young, dull green or yellow on maturity, much curved above half of its height; nodes somewhat swollen, basal nodes often rooting, lower nodes often with branches; internodes 30-45 cm long, thick-walled. Culms-sheaths variable, lower ones shorter, 8-30 cm long with golden brown stiff hairs on the back, sometimes glabrous in dry localities, striate, rounded at the top, margin hairy; ligule 2-3 mm high, toothed; auricles small, blade triangular, awl-shaped, hairy on both sides. Leaves linear-lanceolate, small in dry localities, up to 25 cm long and 3 cm broad in moist areas, rounded at the base into a short petiole, tip sharply acuminate with twisted point, rough and often hairy above, softly hairy beneath; ligule very short. Inflorescence a large panicle of large dense globular heads 4-5 cm apart; rachis rounded, smooth. Spikelets spine scent, usually hairy, the fertile intermixed with many sterile smaller ones, 7.5-12 mm long and 2.5-5.0 mm broad, with 2 or 3 fertile flowers; empty glumes 2 or more, ovate spine scent, many-nerved; flowering glumes ovate, ending in a sharp spine surrounded by ciliate tufts of hair; palea ovate or obovate, emarginate, lower ones 2-keeled, ciliate on the keels and 2-nerved between them, uppermost not keeled, often nearly glabrous, 6 to 8-nerved. Stamens long-exerted; turbinate, stalked, hairy above and surmounted by a long style ending in a purple feathery stigma. This species occupies 53 per cent of total bamboo area in India. Widely distributed in India in semi dry and dry zone along plains and hilly tracts usually up to an altitude of 1000 m., also commonly cultivated throughout the plains and foot hills. They are also growing in other part of Asia and Latin America. D. strictus is widely adaptable to temperatures as low as -5oC and as high as 45oC. This species is mainly found in drier open deciduous forests in hill slopes, ravines and alluvial plains. It prefers well-drained, poor, coarse, grained and stony soils. It occurs naturally in tracts receiving as low as 750 mm of rainfall and also in extensive gregarious patches or as an understorey in mixed forests and teak plantations. Site requirements: Dendrocalamus strictus grows on practically all types of soils provided there is good drainage. It does not grow on water-logged or heavy soils such as pure clay or a mixture of clay and lime. Well-drained localities with sandy loam are the best for bamboo growth. The species is found growing well in the areas having a rainfall between 750 mm-4000 mm and it flourishes in regions where the relative humidity of the air is low. The species is usually not found on precipitous slopes or on flat ground unless it is well-drained. It prefers hilly ground and is resistant to frost and drought. Natural Regeneration: After gregarious or sporadic flowering, under natural conditions, the seeds germinate soon after the first monsoon showers. It is observed that large number of seedlings survive particularly on newly exposed soils. Artificial Regeneration: (1) Seedling: When fruiting occurs seeds are collected by sweeping the ground under the clumps during seed fall. Mature seeds are separated from the chaff by winnowing. Seeds are better collected before the onset of monsoon. One kilogram contains approximately 30,000 seeds. Germination varies from 25 to 61 per cent. A temperature of 30oC and 50 to 70% moisture level in the germinating medium is ideal for germination. Degluming the seeds accelerates germination. A good irrigated nursery with standard sunken beds (12 x 1.25 x 0.3 m) is preferred. The soils in the bed is worked and sterilized by burning the debris and mixed with farmyard manure. Seeds are pretreated for 24-48 hrs in cold water. About 1/2 kg of seeds are sown in a bed in drills 24 cm apart and lightly covered with soil. Germination starts after 7 days and completes in about 17 days. One-year-old seedlings are transplanted in the pits of 30 cm3 at the espacement of 6 m x 6 m. However, it was reported that 2-year-old seedlings give better survival percentage. The roots of the seedlings should not be exposed to sun and care should be taken that the buds on the rhizomes are not injured. (2) Vegetative propagation: Different methods like offset planting, rhizome planting, rooting of culm cuttings and tissue culture are used. One-year-old culms are cut through with a slanting cut about 90 or 120 cm from the ground and the rhizomes to which they are attached are dug up with roots intact and cut off to a length sufficient to include a well- developed bud. Planting is done before the onset of the rainy season. Rhizomes are separated from the mother plant during the onset of monsoon and planted in pits of 45 x 45 cm. Culm cuttings can be used for propagation when seeds are not available. About 40 to 70 per cent of rooting can be obtained in culm cuttings depending on the period of collection, age of culm and treatment with growth regulating substances. Cuttings treated with NAA 100 ppm during February to March gave maximum rooting response (Surendran and Seethalakshmi, 1985). Horizontal planting in the nursery beds was better than the vertical and oblique planting methods. Seasonal variation in rooting response is reported and it is attributed to the variation in nutrient contents in the culm (Gupta and Pattanath, 1976). Observations on fertilizer and spacing trials in the nursery of less than two years, indicated that closer spacing is better and the application of NPK enhance the biomass production by three times (Patil and Patil, 1990). Considerable work has been done on the tissue culture of this species. The various explants used are, node, seed, seedling, shoot, excised embryo and other methods like multiple shoot production, rooting and in vitro flower induction are used, (Zamora, 1994). Growth: The main period of growth of the bamboo is 2-3 months during which time they attain their full height and diameter. The development of lateral branches takes place during the second season of growth. After the first season silicification and hardening of culms take place. Growth is completed about 2 months after the rainy season. There is an initial short period of 14-18 days showing maximum rate of growth (22-33 cm/day) accounting for 25 to 56 per cent followed by moderate growth (11 to 16 cm/day) and subsequently slow growth (9 to 13 cm/day). During the day time, height increment is about 40 per cent as against the night increment of 60 per cent. Maximum growth per day is 37 cm. The months of June-July-August is the season of continuous vegetative activity which indicates that there exist a definite periodicity with regard to growth. As compared to teak, bamboo has in general higher basic strength. A comparative study with mild steel has shown that the average ultimate tensile strength of Dendrocalamus strictus is nearly equal to the strength of mild steel. The specific ultimate tensile strength of bamboo specimen is nearly six times the specific ultimate tensile strength of mild steel. The notch impact strength of bamboo specimens is only about 15-20 per cent of the impact strength of mild steel. But by taking into account the densities of mild steel and bamboo, the specific impact strength of bamboo specimens is 50 per cent greater and specific impact strength of bamboo specimens soaked in araldite is 100 per cent greater than the specific impact strength of mild steel. Bamboo specimens have poor torsional shear strength in comparison to the torsional shear strength of mild steel. 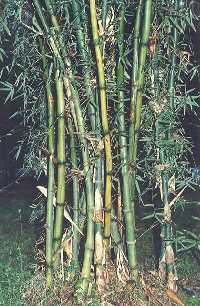 Bamboos have maximum stiffness along the fibres and minimum stiffness transverse to the fibres. The variation of modulus ratio (E/E2) for bamboo specimen is similar to the variation of modulus ratio of fibres reinforced composities. Fresh bamboos can be treated by the following methods (1) Steeping (2) Sap displacement (3) Diffusion process (Singh and Tewari, 1981). Dry bamboos can be treated by soaking and hot- cold process. In another study, brush application with the oil type or water soluble type or solvent type of preservatives, particularly of the last kind is recommended. It is found that the untreated bamboo has a service life of 2-5 years. By open tank treatment the service life can be extended to 10-15 years and by pressure process further it can be enhanced to 10-20 years. Untreated bamboo used as posts are destroyed by termites and fungi in about 1 or 2 years. It is reported that bamboo under cover, or used for structural use lasts for 2 to 5 years. Natural durability varies from 18 to 30 months. Loss due to fungi and insects can be reduced by proper treatments at the time of stacking and storage. To prevent termite attack stacking is done on raised ground along with the application of lime sludge and 2 per cent BHC. Traditional non-chemical methods of preservation include controlling starch content by adjusting felling season, age of felling, water soaking and post-harvest transpiration. Other methods include baking on open fire, lime washing and other coatings. Preservative treatment of dry bamboos, the methods used are soaking, hot-cold process and pressure treatment. 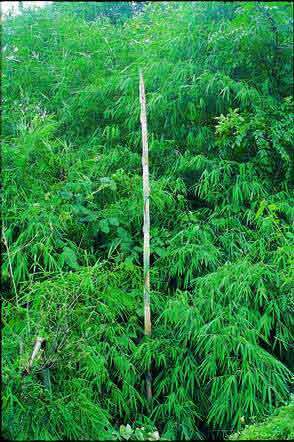 This species is one of the two most important bamboos because of it thick wall and able to take in nail without splitting the bamboo. It actually can be work like the wood. It is found suitable for reclamation of ravine land. It is extensively used as raw material in making bamboo furniture, paper mills and also for a variety of purposes such as construction, agricultural implements, musical instruments, furniture etc. Young shoots are commonly used as food. Decoction of leaves and nodes and silicious matter is used in the traditional medicine.